Puerto Rico was victim to the devastating Hurricane Maria, which has left the majority of the island without basic necessities like electricity, water and food. In order to help the aid reach the struggling island, Donald Trump has lifted shipping restrictions in order to get vital resources to where they are needed most. And in a bid to raise awareness and support the relief campaign, Hollywood is stepping up to the plate with the best tool they have – comedy. The famous faces of the good and the beautiful were probably not so good or beautiful during their awkward teenage years and to help raise money for the victims of Hurricane Maria, celebrities are sharing their old dodgy school pics. This started when Nick Kroll went on Stephen Colbert’s show and challenged celebrities to share the questionable pics of themselves in order to help raise vital money needed for the relief campaign. Nick was promoting his new show all about puberty and growing up and encouraged celebrities to tweet pictures of their awkward formative years with the hashtag ‘PuberMe’. Colbert had a spur of the moment idea to contribute funds to the One America relief fund for every celebrity who contributes to the hilarious twitter trend and more specifically, he’s promised $1000 for every celebrity post who reveals their awkward past. Obviously, celebrities have posted up in their droves, including top names like James Corden and Lena Dunham, and Colbert announced on his show tens of thousands of dollars had already been donated as a result of the pictures. This money is much needed in Puerto Rico after Hurricane Maria hit the island just two weeks after Hurricane Irma knocked out power on the island. Maria has claimed 30 lives in the Caribbean, including at least 24 in Puerto Rico. For those who survived the natural disaster, almost half do not have access to clean drinking water, and over 90 per cent of the island’s homes are damaged. Over one in three hospitals on the island are not operational, resulting in an inability to treat those who are injured as a result of debris and damage to the infrastructure. Immediately after the disaster on Puerto Rico, Trump was silent on Twitter, choosing instead to tweet about the burgeoning controversy surrounding the ‘Take A Knee’ campaign across American sports. Puerto Rican dancer and Grammy winning artist Marc Anthony told Trump to ‘shut the f*ck up about the NFL [and] do something about our people in need in Puerto Rico’. The hurricane was a Category 4 when it hit Puerto Rico, after downgrading from a Category 5 when it hit Dominica. 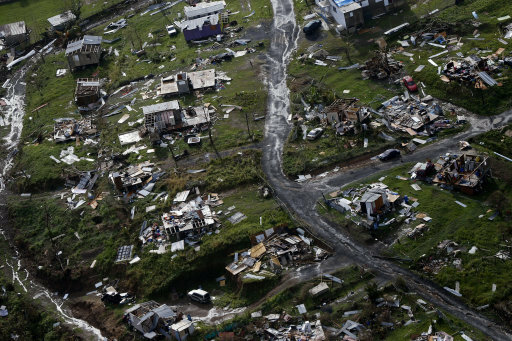 The hurricane followed much of the same path as Irma, further exacerbating the already desperate humanitarian crisis in the Caribbean and Antilles. The hurricane was first registered on September 13 from a tropical wave, but there were unusually favourable conditions for it’s intensive growth and it was a full blown hurricane by September 18. It’s been registered as the most intense hurricane in terms of central pressure to ever hit the territory in recorded history. Let’s just hope this relief fund can go some way to alleviating the humanitarian crisis in the area.